Level 1 – Air awareness and cardio! Adult Trampoline 1 will introduce students ages 16yrs and up to the basics of bouncing on a trampoline. Students will focus on developing aerial awareness, core strength, agility, and stability. Basic trampoline movements, twisting, and rotating will be explored. Trampoline 2 is our intermediate adult trampoline class. Students will build on the basic trampoline skills learned in Trampoline 1, refining their technique and improving aerial awareness, core strength, agility, and stability. 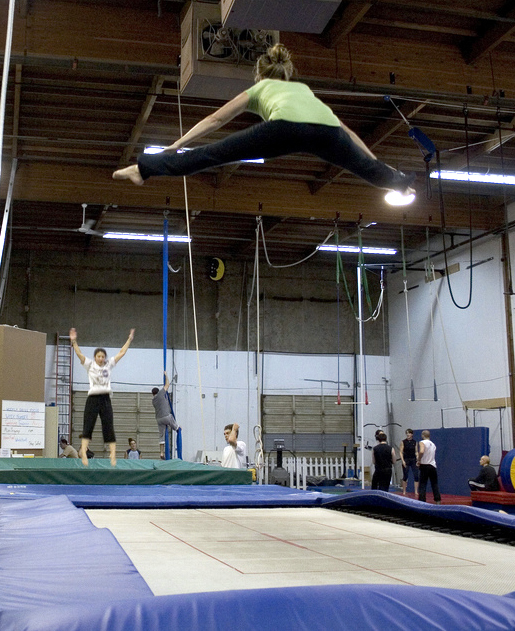 Adult Trampoline 3 is our most advanced adult trampoline class. Students will combine skills learned in their previous adult trampoline classes and create increasingly difficult skill sequences.